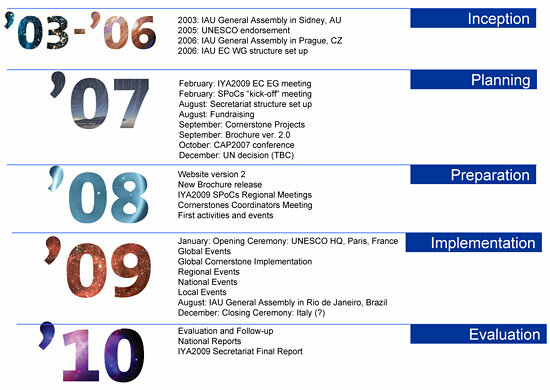 In July 2003, at the IAU General Assembly in Sydney, Australia, the IAU voted unanimously in favour of a resolution asking the United Nations to declare the year 2009 as the International Year of Astronomy. In October 2005 UNESCO endorsed the IYA2009 and on 20 December 2007 the United Nations proclaimed 2009 as the International Year of Astronomy. The year 2008 was spent on preparing the Year and all its activities, and 2009 is naturally the focal point for all these activities. In 2010 the IYA2009 organisers will scrutinise performance at all levels and assess public perception of the IYA2009 experience with the intention of answering the following questions: Were the objectives of IYA2009 met? Has public appreciation of science changed as result of the IYA2009? What were the unexpected outcomes of IYA2009?